I don’t care about your body is the third solo exhibition by Annabel Daou at Galerie Tanja Wagner. She was walking backwards. She was thinking that bodies don’t matter. She was thinking that only bodies matter. She wanted to build a city out of material used to make tents. She was thinking of a city that was now in ruins. She wanted to catalogue everything they did there. She bought paper for the last time from a store that had been around for a hundred years and was closing for good in September. She had been reading about rules of engagement and the regulation of intersecting bodies. She dyed the mending tape red and black before writing on it. She was thinking that there is no way to tell one’s own story, but that you can sometimes tell the story of someone who might have been there. She knew cities were always burning behind her and she knew that, as always, there were consequences to looking back. 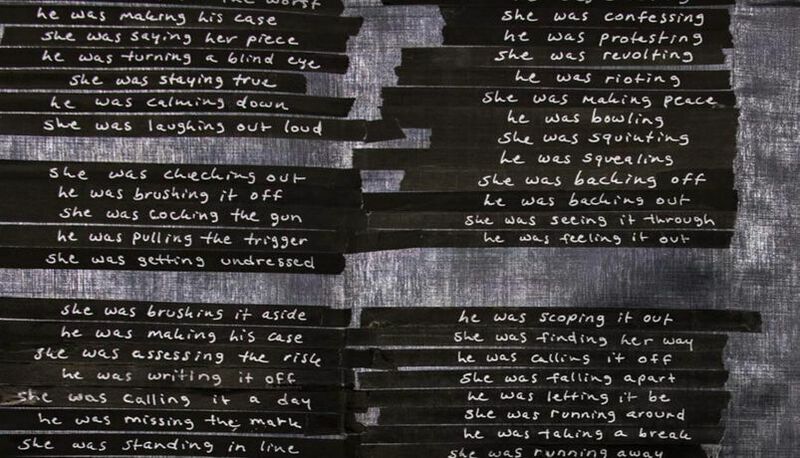 Annabel Daou’s works occur at the intersections of writing, speech, and non-verbal communication. Her paper/plastic-and-tape-based constructions, sound pieces, and performances explore and map the language of power, intimacy, and self-encounter.